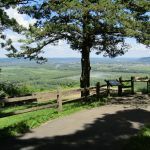 Ask fellow campers about "Wyalusing State Park" and nearby attractions. Price above is the "base" price for reserving the site. Wisconsin charges extra for the use of their state parks. As out of state, the choice was an extra $11/night for the RV, or to buy an annual park pass for $38. With that said, the price for this park is absolutely worth it. I stayed in the Wisconsin Ridge campground portion, which offers access to some amazing views, right from the camper. 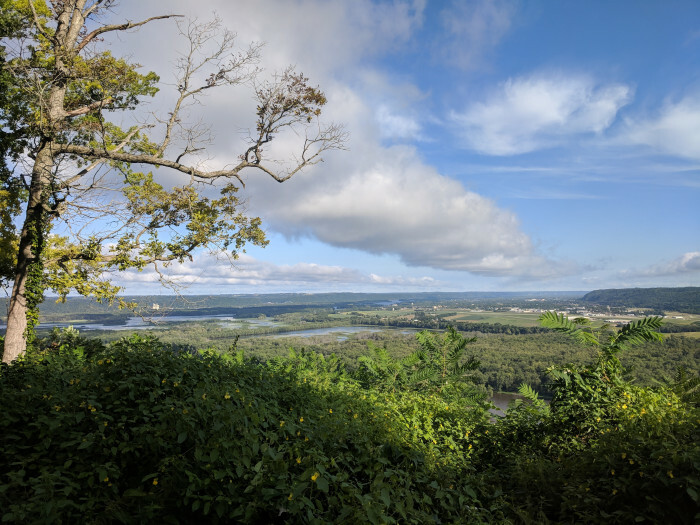 The ridge is above the Wisconsin River where it meets the Mississippi River and overlooks the town of Prairie Du Chien (don't expect dark skies here, there is a well-lit regional airport down there). The campsites that are right on the ridge mostly don't have any hookups, but right across from those are some electric sites that still give a great view. The campground also has miles of well-marked trails. Larger rigs and trailers may have some trouble getting into some of the sites. A few of them are angled strangely and, even with my small RV, I had to perform a few maneuvers to get it angled in properly. Once settled though, it was a great park. There is a concession stand up on the Ridge, and a small campstore right before the park entrance that offers all the basic supplies and cheap firewood as well. We camped at Wyalusing State Park in a Motorhome. 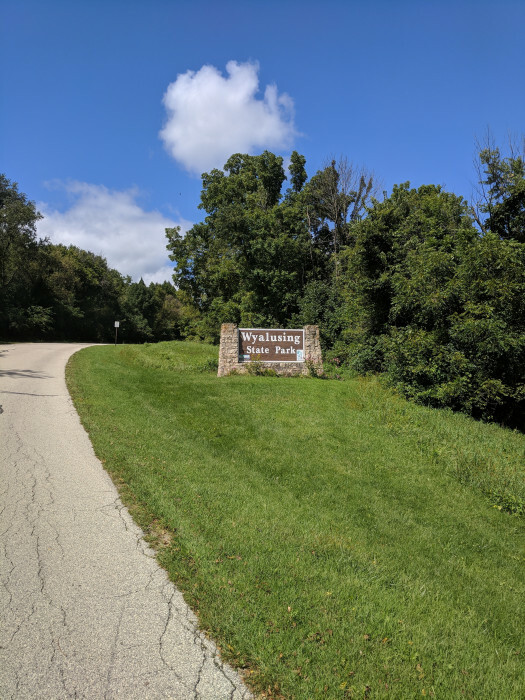 Wyalusing State Park has two campgrounds; Wisconsin Ridge and Homestead. 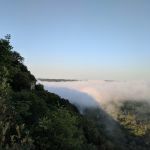 Our review pertains to Wisconsin Ridge, which we recommend because the views and sunsets are amazing! 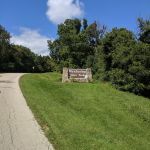 This campground is set along a ridge that overlooks the confluence of the Wisconsin and Mississippi Rivers. There is one long loop road that goes along the ridge, with the inner sites electric. All but one of the outer ridge sites are non-electric. About half the sites are reservable. The view is so incredible that it would be worth getting a ridge-side site without electricity. The site are all fairly level and include a picnic table and fire ring. Most sites have some sort of shade. The bathhouse is very nice with plenty of bathroom stalls and individual showers opening to the outside. A concession stand with basic essentials and firewood is at the top of the ridge. The terrain around the campground is steep in places, so your calves will be feeling it. We camped at Wyalusing State Park in a Tent Trailer. Stay along the ridge! The views are worth giving up electricity for. As others have said there are two campgrounds and we usually stay in the lower but this time we stayed in the ridge campground. The sites closest to the ridge offer amazing views some of the best you can get in WI from a campsite. The sites up there a little tighter and do not offer much privacy but the views are worth it. We where one of four campers up there that weekend so it was pretty quiet. It's definitely worth a visit if in the area. We camped at Wyalusing State Park in a Travel Trailer. We stayed at the lower "Homestead" campground. Only 9 of the 150 sites have electric and none of these are reservable.You must fill tank with water at dump station as the spigots in the campground have no threads.Sites are very wooded with gravel pads. Price includes the daily $9.00 park access fee. WI residents and WI seniors get a discount.Park was quite full but still very quiet.Price seems too high for non-residents. We camped at Wyalusing State Park in a Travel Trailer. Visit Villa Louis in nearby Praire du Chien. Wyalusing is a beautiful, clean and well maintained Wisconsin State park. Site 55 on the Ridge was perfect for our Class B motorhome. Loved the clean bathrooms. Showers were free, hot, and very private, with individual entry. Hiking, biking, and just enjoying the beauty of this fabulous state campground. 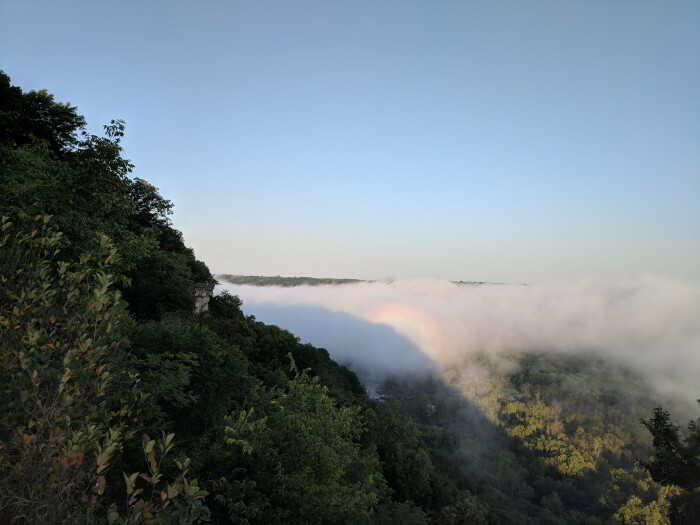 We camped at Wyalusing State Park in a Motorhome. There are two campgrounds, one on the bluff with the view, and more open, the other in the wooded area, and more secluded. Wonderful scenery and wildlife. The only downside, the showers in the Homestead (wooded) campground have been closed for three years and you must drive to the other campground to take a shower, but they are modern and very nice. Lots to see in the Prairie Du Chien area. Still our favorite state park. We camped at Wyalusing State Park in a Travel Trailer. Really wonderful state park. Two distinctly different campgrounds. 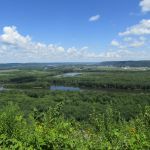 The Wisconsin Ridge campground offers spectacular views of the Wisconsin River valley. The Homestead campground offers a quieter, more wooded setting. The whole park is well maintained, and staffed by friendly folks who try their best to make your stay enjoyable. Lots of well maintained trails that wind through a variety of terrain. They have a canoe rental and a well marked canoe trail that will take you through Mississippi River backwaters. A definite family destination. The only downside (keeps the park from being a ten) is the lack of showers in the Homestead campground. We camped at Wyalusing State Park in a Fifth Wheel. We had an electric site number 205E with 30 amp power. Fire rings are bigger than most campgrounds. There were very few mosquitoes! At night you can see many fireflies. There is a small but cool cave on their many hiking trails. There are at least 4 scenic overlooks in this park. The views are the most spectacular in the state of Wisconsin. From some of these views, you can see where the the Wisconsin River meets the Mississippi River. There is so much to see here, we couldn't get it all in, in three days. We're definitely going back sometime soon. We camped at Wyalusing State Park in a Travel Trailer. The views from the campground are breathtaking. The new shower and restroom facilities are exceptionally nice. The roads and general appearance need some repairs. The lady at the check-in office was exceptionally helpful, and knowledgeable. The campground hosts were also great. It is a great park. We camped at Wyalusing State Park in a Travel Trailer. We initially stopped here for one night while traveling through the area, and ended up spending another night. Beautiful sites up on the bluff with nice views to the west. Hiking trails are plentiful with Effigy Mounds inside the park to see. The camping rate reflects the camping fee only and since we were non-Wisconsin residents we got to pay another $10 (per day) fee for park entry. If we were able to use Wisconsin State Parks more often in a given year we would purchase an annual pass. We camped at Wyalusing State Park in a Fifth Wheel. This is a great State Park. Scenic, good staff, and a fun place for children. Lots of hiking trails. We camped at Wyalusing State Park in a Motorhome. Our family had a wonderful time camping at this park last weekend (June 2008). The sites in WI ridge were very spacious also with a beautiful view overlooking the bluffs of the WI river. We had site 120 which was at the end of a cul de sac. Our children ages 4 and 7 had a great time hiking and biking (lots of great exercise.) My husband also rode on one of the mountain bike trails as well and saw deer on the trail, very peaceful. For some down time, the we also did some crafts at the nature center for the kids. The playground is close as well. We will return to this wonderful state park soon. We camped at Wyalusing State Park in a Travel Trailer. Not sure where the previous poster camped, but it wasn't at Wyalusing. This SP has no mini-golf or full-hookup sites. Most sites are not tight, but well-spaced, typical of Wisconsin SPs. Wis. Ridge CG has a view to die for! We camped at Wyalusing State Park in a Travel Trailer. A great place to camp with your family. We had a great time. The staff was very friendly. The restrooms and showers were clean. A nice playground, pool and mini golf. My only bad comment is the full hookup sites are to close together. The fire ring is next to were you park your truck. We camped at Wyalusing State Park in a Travel Trailer. 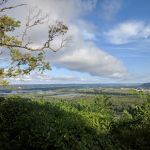 Are you affiliated with Wyalusing State Park ?